Throughout film history, there have been several WW2 dramas with “Operation” in the title, including: Operation Crossbow (1965), Operation Daybreak (1975) and Operation Pacific (1951). 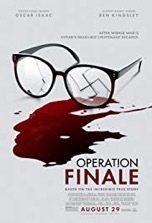 Now there’s Operation Finale, a historical biopic from director Chris Weitz and actors Ben Kingsley and Oscar Isaac. The movie has an intriguing premise… Adolf Eichmann (Kingsley), one of the chief architects of Hitler’s “Final Solution,” disappeared after the war. Since Eichmann evaded capture, he was never brought to justice during the Nuremberg trials. Fast-forward to 1960. Mossad agent Peter Malkin (Isaac) and his team of secret agents track down Eichmann, who’s been living under an alias in Buenos Aires. After a series of narrow escapes, Eichmann is captured and delivered to Israel, where he finally stands trial for his crimes against humanity. If that synopsis makes the movie seem straightforward, predictable and inevitable, it is. Here’s a movie that could’ve been a first-rate period piece with a poignant message, but instead squandered its potential on a ponderous plot. Surprisingly, Weitz is responsible for much of the movie’s underachievement. I say “surprisingly” because Weitz has had a good deal of success contributing (as director, writer or both) to adventure driven fantasy/sci-fi movies in the past, like: The Golden Compass (2007), The Twilight Saga: New Moon (2009) and Rogue One: A Star Wars Story (2016). Here, Weitz’ direction is consistently arthritic, and his stiffness of form isn’t aided by rookie scribe Matthew Orton’s sluggish script. Orton’s story is adversely uneven: the first half is terminally slow while the second half is a taut thriller with a satisfying, if haunting, resolution. The movie is just over two hours in length and a good 15 to 20 minutes could’ve been excised with negligible impact on the story. If the movie has a saving grace, it’s the superb performances of the two lead actors. The scenes with just Isaac and Kingsley are the meat of the movie; the screen chemistry between the two actors is palpable and undeniable. The mental chess match that ensues between their characters is utterly enthralling, and it’s to Isaac’s credit that he’s able to hold his own against grand master Kingsley. Isaac does a fine job of keeping his character’s emotions in check…he delivers a beautifully understated performance and is believable throughout. Kingsley, as would be expected, is the movie. His portrayal of the nefarious mastermind of the Holocaust is effectively restrained and finely measured—our utter loathing of the character gradually turns to sympathy when we learn more about the man from his back stories. It’s plain to see that Kingsley elevated the production with his very presence. Without him, the movie would’ve been a glorified indie film with a gravitas vacuum. Kingsley, no stranger to WW2 films, acted in Schindler’s List (1993) and Walking with the Enemy (2013). There’s an appreciable disparity in ages between character and actor: at the time of his capture, Eichmann was 54; at the time of filming, Kingsley was 74. The early stages of the film are inundated with a number of distasteful racist comments. One anti-Semite makes the reprehensible remark that Jews seem to “pop up everywhere, like mushrooms after the rain.” Another rabble-rouser refers to Jews as the “rot in society.” Though upsetting, these remarks are an important reminder of the ugliness of racism and how it pervaded the 60s and, sadly, still persists in the world today. At the heart of the film is the theme of loss. On an individual level, Malkin and Eichmann have each lost something—the former, his sister; the latter, his humanity. Widening the lens, the film’s mass scale loss was the deaths of 6 million European Jews during the Holocaust. One of the compelling aspects the film foregrounds is the fine line between justice and revenge. In a couple scenes, Malkin admits that putting a bullet in Eichmann’s head would be far easier than smuggling him out of Argentina. Though it’s tempting for Malkin to exact revenge for what Eichmann did to the Jewish people, he is determined to capture the Nazi so that justice can be served. Rather than torture Eichmann to obtain his signature, as his fellow agents want to do, Malkin opts for a more humane approach. Malkin’s “good cop” strategy proves successful both in securing the signature and in creating a bond between himself and Eichmann. Even though Eichmann claims that all humans are animals, he reveals that he tried to facilitate the escape of some of the imprisoned Jews and shows remorse over his past actions, which serves to redeem his character…at least a little. In the end, Finale is a mild disappointment because it’s slow-moving and overlong. Still, it showcases the talents of two superb performers; one is an Oscar winner at the top of his game, the other is named Oscar and is an emerging star. Finale touches on many universal themes, including the deceptive nature of evil and our intrinsic need for justice. It’s a worthwhile film because it memorializes the Holocaust without glorifying it. Finale reminds us of the heinous acts that were committed during one of the darkest chapters in human history…lest we forget.